OnTarget is experienced in all types of Tactical Research. We understand how to build lists of companies based on industry, geography, or vertical, and we can find the right contacts to target within your target companies. We encourage our clients to template recent customer wins on the marketplace and target those for new business. Using case studies and reference-able accounts in marketing typically yields great results. In researching companies, one of the first steps is to determine if it is a publicly held or a private company. Researching private companies is more challenging. Since private companies are usually not required to file reports with the Securities and Exchange Commission, locating information about them tends to be more difficult. Therefore, you may need to revise your expectations and be more flexible in what you will be able to find. For example, you might not find financial reports on private companies; instead, you may need to accept a revenue range or estimate, company ranking by revenue, or even inferred revenue based on information known or presumed. While information published on private companies may be conjecture, filings with the federal or state government should be more reliable because of government penalties for misreporting. There is usually less published about smaller companies than larger companies. Understanding the decision-makers within a prospect company is critical, and having accurate contact information for the buyers and influencers within those companies is step one of OnTarget’s process. Name, Title, Address, City, State, Zip, Email, Telephone and Functional Area of Responsibility are the common requirements for complete contact research. Each company typically has multiple decision-makers and influencers that need to be defined, and OnTarget can help. 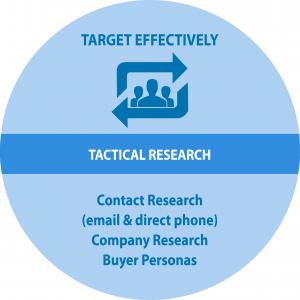 Our systematic process to contact research enables a complete and accurate database to be readily available when B2B marketers need them – for their internal marketing efforts, or for the outsourced prospecting work OnTarget provides. Key Characteristics of the Target Audience – The makeup of the target audience (e.g., age, location, attitudes, etc.) impacts what is conveyed in the message. Most Effective Type of Media to be Used – The media outlet (e.g., television, print, Internet, etc.) used to deliver the message impacts the way a message will be created.